The 2015 Ann Arbor Mini Maker Faire Is Coming! 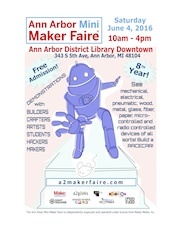 We’re excited to announce the seventh annual Ann Arbor Mini Maker Faire! 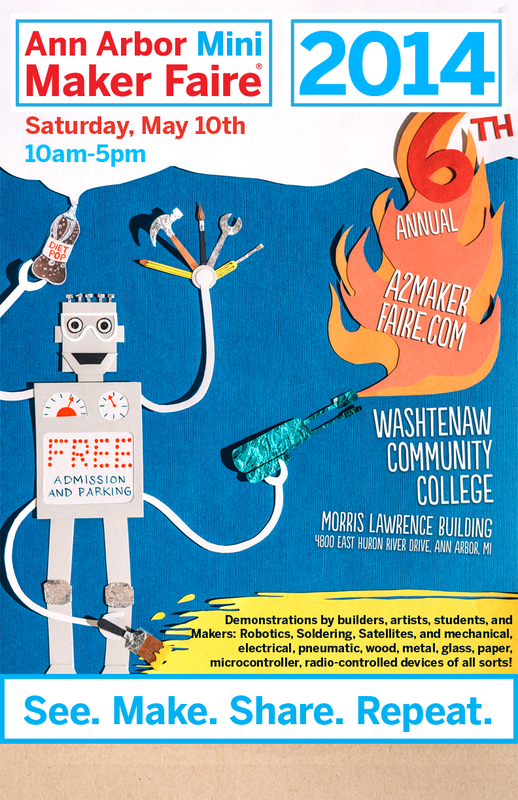 The Faire will be held again at the Morris Lawrence Building on the campus of Washtenaw Community College. This free, all-ages event features community members of all types who come together to display their ideas, projects, and inventions. This year we’ve partnered with Brain Monkeys to focus especially on young makers across our schools and learning settings. Soon we will be seeking applications from people and groups with engaging, inspiring, and just plain cool projects. We’re seeking projects that focus on the process of creating, designing, and making – not just displaying a final product. Makers of all ages and experience levels are encouraged to submit applications. We will begin seeking applications for makers very soon. We had some great exhibitors this year. You’ll likely always recognize some friendly faces in the A2MMF maker crowd but we also always get new folks. This year we featured a lot of the area’s FIRST teams and had a whole corner of the faire dedicated to robots and robotics. First, a huge thanks to all these folks: those who return each year and those who are new to the Ann Arbor Mini Maker Faire. You make our faire the success that it is each year. Here’s the full list of the 2014 Ann Arbor Mini Makers! By partnering with Washtenaw Community College this year, we have access to a broader range of spaces for our Makers. Those spaces include classrooms, computers labs, and (next year) an auditorium. This means we can offer a broader range of educational opportunities for participants this year. We’ve invited five groups to speak more in depth about their work with time for questions and answers (twenty minute presentations). You can come in, take a look at their work, listen to what they have to say, and possibly learn a bit more about what they do than you might if you were just passing by their booth. We’ll have signs up at the Faire directing you to these fine folks’ talks. Many of them also have booths so you can follow up if you are particularly interested in their work. 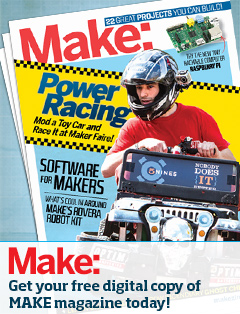 We hope you’ll enjoy this new feature of the Mini Maker Faire! For a full list of speakers and their talks, check below the jump.